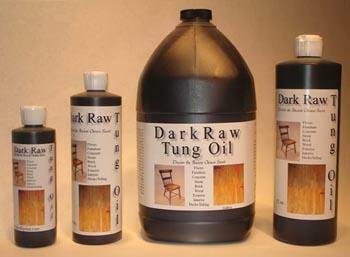 Created from the seed of the tung tree, our Wood Finishing Dark Raw Tung Oil provides you with a biodegradable, ecofriendly option to cleaning and finishing wood furniture and hardwood floors. After you apply this product to your already-stained furniture, prepare for it to endure years of wear and tear as the tung oil creates a water and abrasion resistant coating that's made to last. Combine with our Wood Finishing All Natural Citrus Solvent to apply an all-natural, dark-matte layer to your furniture or floors. Call one of our Amish furniture specialists today at 1-866-272-6773 to learn more about the benefits and advantages of using our 16-Ounce Wood Finishing Dark Raw Tung Oil.